I think I do some of my best work late at night…I’m probably not the only one who feels that way! Things are much quieter then, and I find that I don’t “overthink” my cards and projects as much as when I’m working on something during the day. At first, I was a bit intimidated by this week’s Get Sketchy challenge (#46). I wasn’t sure how I’d fit everything onto one card without it looking too busy, but crafting at night helped my creative process on this one. The iced coffee that I drank this afternoon probably helped a bit, too! Here’s the sketch…I hope you’re inspired to play along! This is a fun one! For my card, I rotated the sketch, and went with a coffee theme! The sentiment and coffee bean stamps are from Crafty Secrets (Tea & Coffee set), and the coffee go-cup is by Elzybells Art Stamps. The background paper is from Jillibean Soup. I used Bo Bunny Double Dot as the background for the sentiment stamp. 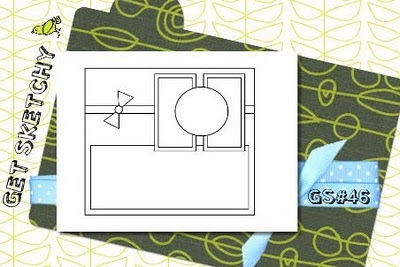 The ribbon is by Stampin’ Up! Instead of one long strip of paper, I made a mosaic out of the stamped background. I stamped the sentiment and coffee beans on kraft paper (SU Chocolate Chip ink). One of the hardest parts was cutting out the espresso grinder…I didn’t realize how thin the paper was! I colored the coffee cups with a bronze gel pen. 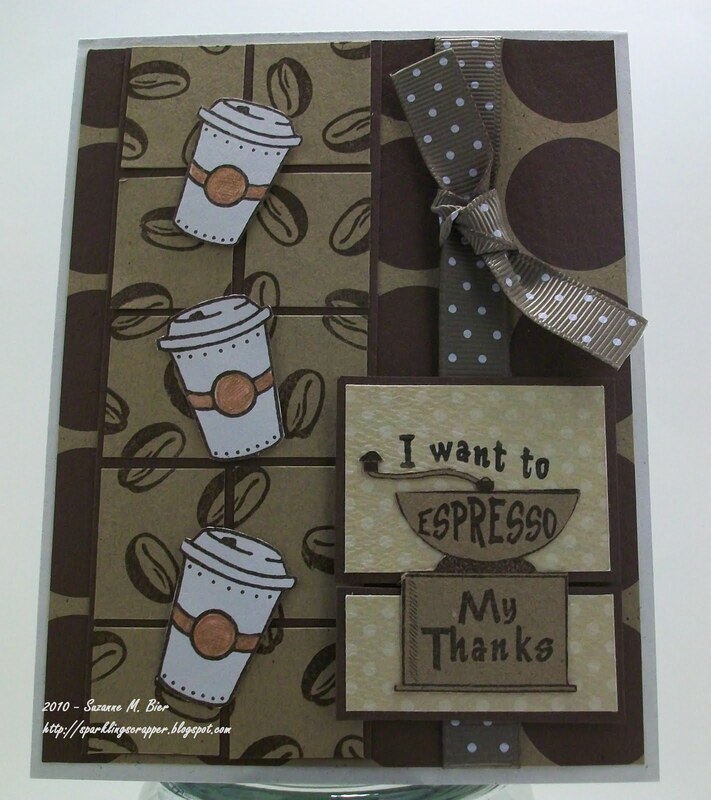 I adore your coffee themed card; it doesn’t look too busy at all! The coffee grinder is cut beautifully; I have trouble cutting as well!